I’ll be honest up front and say that generally, The Wave…of American Flavors at Disney’s Contemporary Resort has not been among my favorites. When the restaurant first opened in 2008, the food being served was surprisingly good. The menu featured farm-to-table fare, prepared with a great deal of creativity and care. As often happens with Disney restaurants, as time went on, the quality dipped, so much so that it became one of my least favorite restaurants. Fast forward to May of last year when, without any other real options, I had lunch at the restaurant and was more than pleasantly surprised. So, on a recent morning before heading off to the Magic Kingdom, myself along with Steve Porter and Eric Gross decided to try breakfast. The first thing we noticed was how subdued this restaurant was. 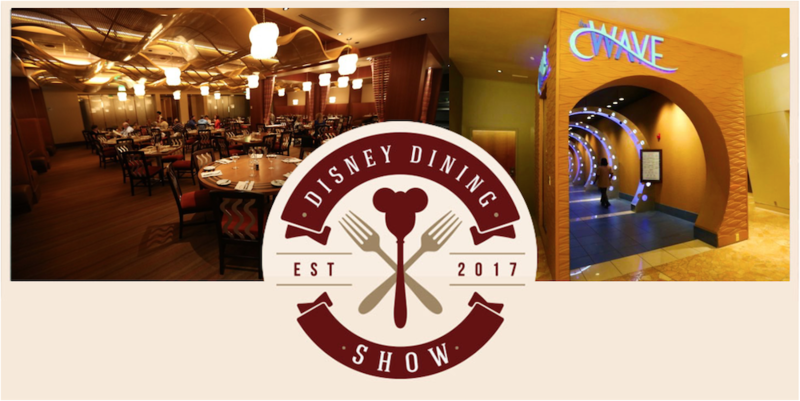 Unlike the frenetic clamor that has become a hallmark of dining at Chef Mickey’s (not to mention the horrific food), the Wave offers a much more relaxed, quiet, almost intimate atmosphere. 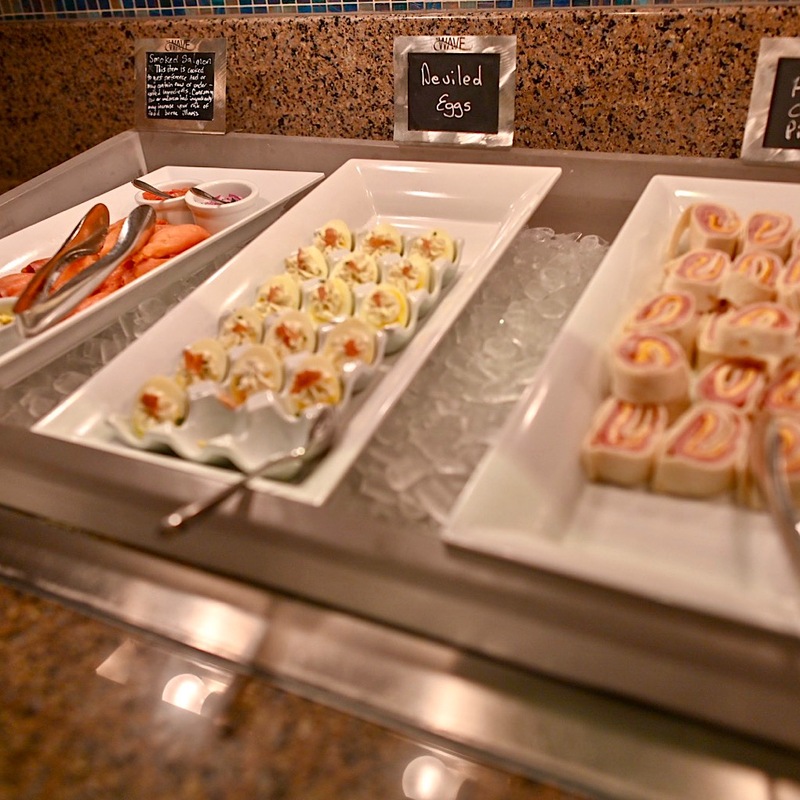 The breakfast offerings at The Wave consist of two options: a $22 all-you-care-to-enjoy buffet that features much of the standard fare for a Disney breakfast (Eggs Benedict, Mickey waffles, bacon, sausage, cereal, etc), as well as some unique options (smoked salmon, egg white frittatas, chorizo eggs among many others) — or you can order from a very enticing, if not unusual, à la carte menu. 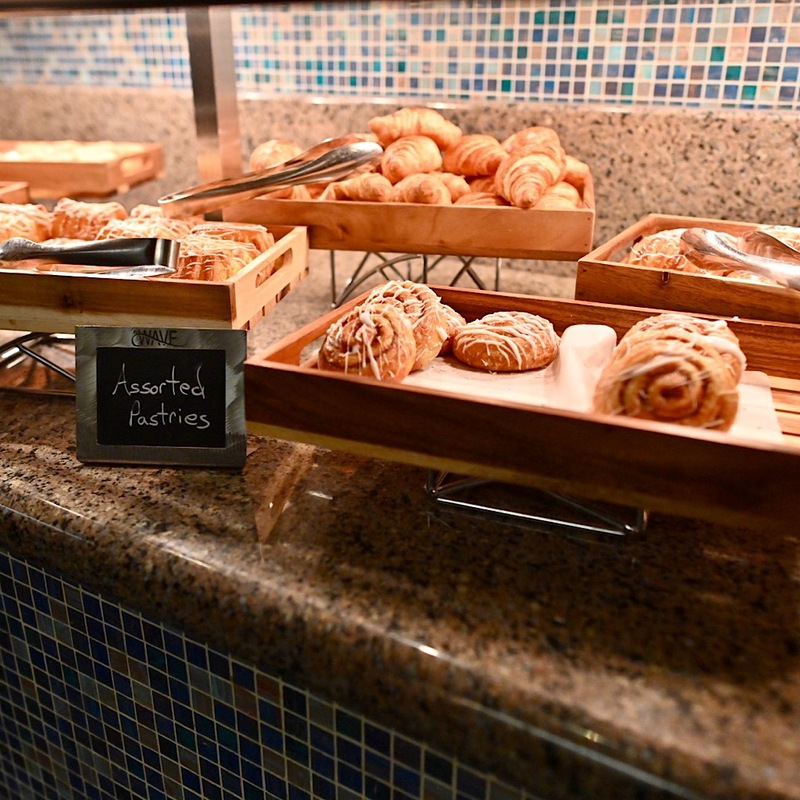 As a breakfast buffet, its offers are extensive, especially when you consider the location and the price point. Steve Porter was the one who decided to try the buffet. He mentioned to us that he and his wife often eat breakfast here, and his experience has always been positive. Unfortunately, on the day we ate there he was less than impressed with the buffet. It seemed like many of the items were either poorly prepared or just old. The “scrambled eggs” on offer seemed to be the powdered eggs — something Disney has been doing less and less of in recent years, so it was a disappointment to find them here. Of note, however, is that the eggs Benedict served on the buffet are the same ones offered on the ala carte menu (and they were excellent). The bakery items that were offered were unremarkable, with words like “Entenmanns” and “store-bought” being used to describe them. 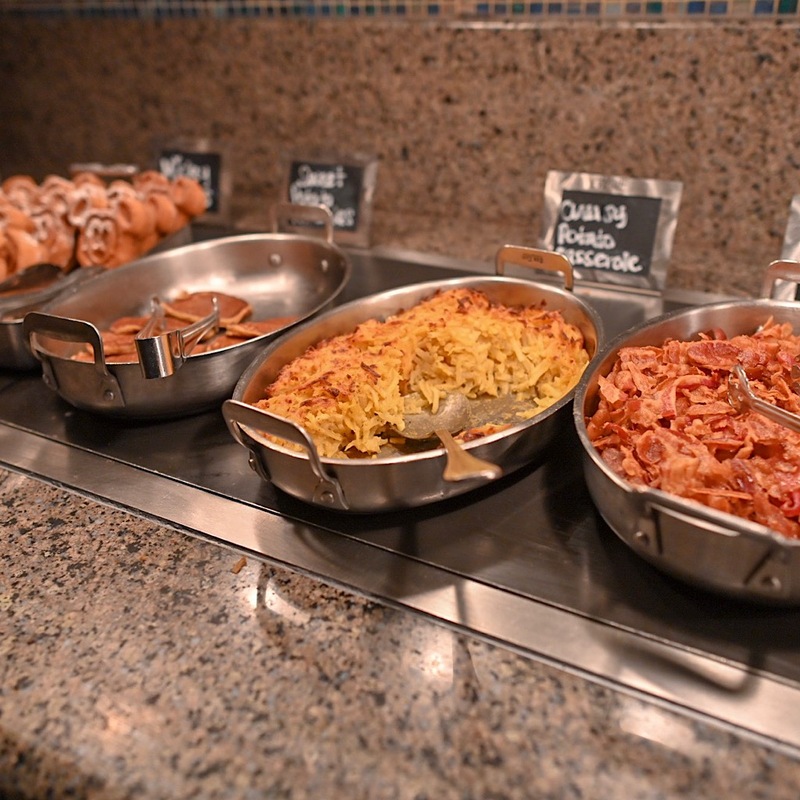 One of the few positives worth mentioning at the buffet was the bacon. Steve enjoys his bacon crispy, and so he was delighted that the buffet wasn’t full of chewy/fatty bacon. We ordered a few options off the menu that really caught our eye. 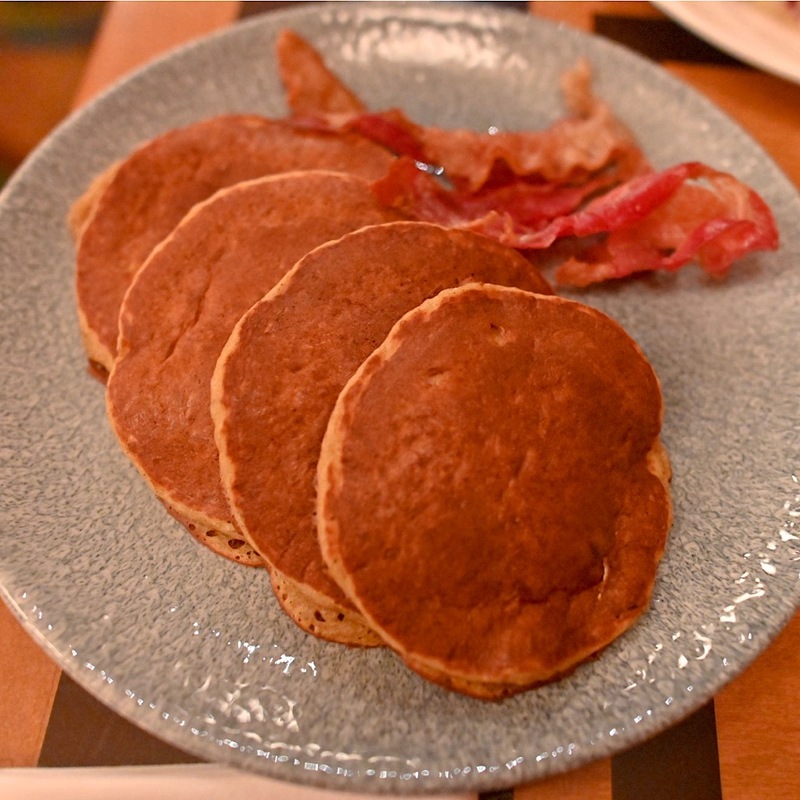 Among the items on offer were the Wave Signature Sweet Potato Pancakes, served with pecan-honey butter and a choice of bacon, pork sausage, or chicken sausage for $14. The mix of flavors on this plate was amazing. I’d never tried sweet potato pancakes before — in fact, I’d never heard of them before — but these were nothing short of delicious. The combination of sweet potatoes and warm spices made this Eric’s favorite meal. Another à la carte item we ordered was the eggs Benedict for $15. As I mentioned previously, these are the same eggs Benedict offered on the buffet. While the eggs were slightly over-poached, the hollandaise sauce was amazing. It was the perfect blend of savory and tangy (oftentimes restaurant hollandaise can tilt one way or the other). The breakfast potatoes served with the dish were also especially good. 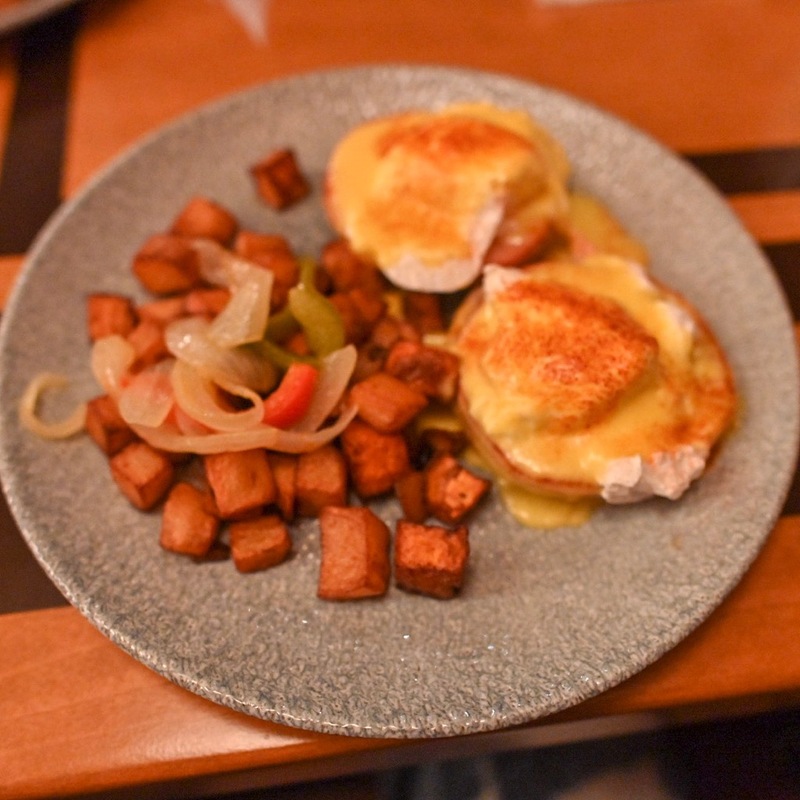 Another option for eggs Benedict on the menu is the Floridian Eggs Benedict for $17. This dish replaces the Canadian bacon with crab cakes. While both these dishes were very good, the most bizarre (and frankly best tasting) of the three we ordered had to be the glazed donut French toast for $15. 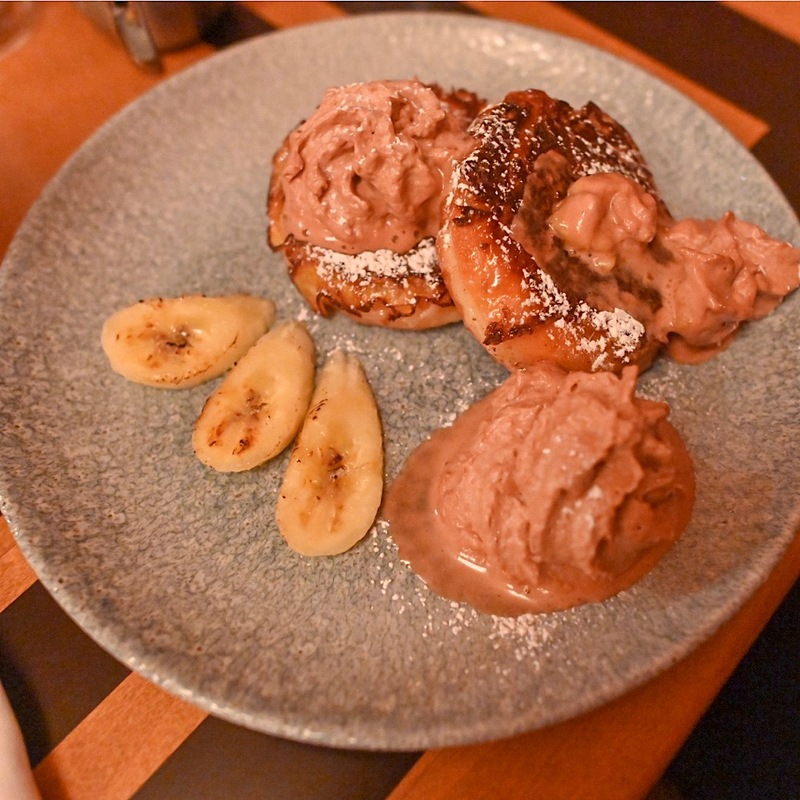 This dish consists of two glazed Krispy Kreme donuts with a salted banana-caramel and chocolate hazelnut whipped cream. This dish was decadent. The donut was crispy yet still retained a soft, warm center. Definitely worth trying. In addition, the restaurant offers some adult beverages. Eric tried the Seasonal Spiked Latte (described on the menu as “organic coffee with spirits and flavors inspired by the season”) for $10. This was one of his least favorite alcoholic drinks on Disney property. The beverage was watery, and the Rumchata did not pair well with it. Our server Tim was a real highlight of this experience. He was all energy (even described by Steve as “Caffeine personified”), very knowledgeable about the menu, made sure every one of our drinks was refilled before they were empty and checked on our table repeatedly. We noticed he was doing this with all his tables, not just ours. 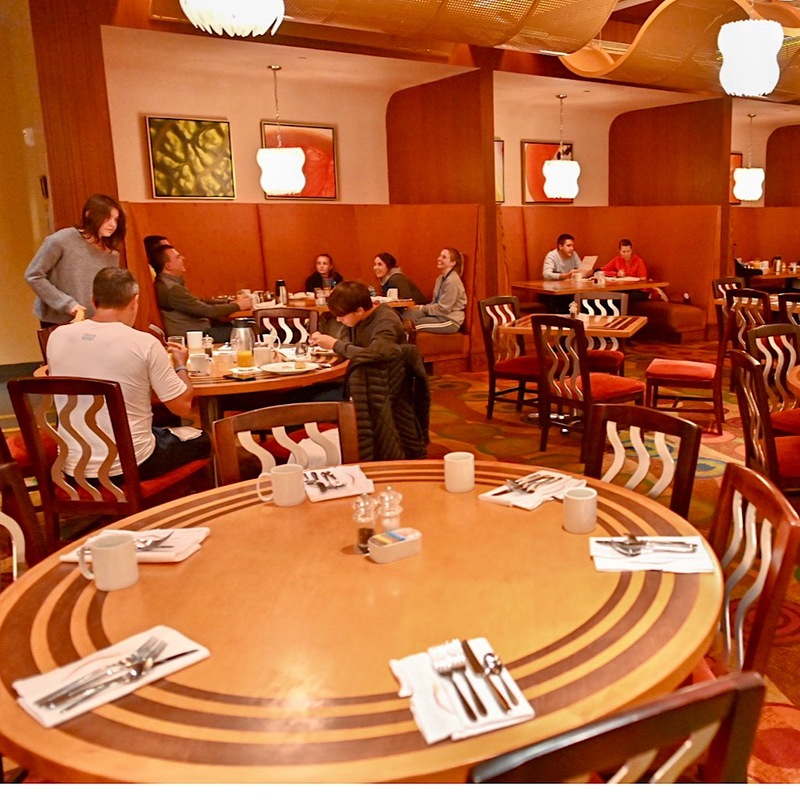 Sometimes when they see the cameras come out, they realize we’re bloggers and the experience can change, so I pay careful attention to how other tables in the area are being treated, even going so far on some occasions as to ask them about their experience. This is an experience more suited for adults than for children, so that should be a consideration when booking this. That being said, we give the Wave high marks and a strong recommendation for breakfast. 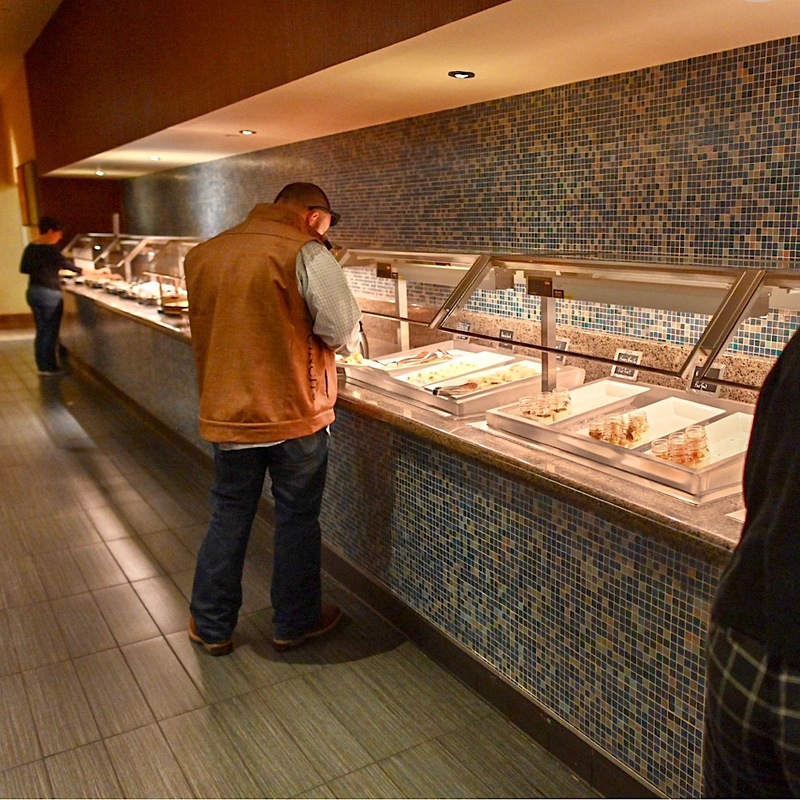 Since Steve has done the buffet several times and always had a good experience, I can chalk up the buffet issue to a bad day. The à la carte items on the menu that we tried were creative, well prepared, and delicious — and not absurdly priced given that this is a meal that is just steps away from the Magic Kingdom. This, coupled with the fantastic service, makes it a restaurant I want to go back to again. In short, you could spend far more and get far less — The Wave is a great option for breakfast! The Wave…of American Flavors requires a single table service credit on the Disney Dining Plan and accepts Tables in Wonderland.